TGS MLB PREVIEW: PLAY BALL! .2019 NL "FUTURES" TO WATCH! After our look at the American League, we take a look at the featured win "totals" in the National League. NL EAST: BEST BET...While the masses seem to be fawning over the Phillies (who we’ll get to in a moment) and their recently-signed Bryce Harper, the Atlanta Braves (86) seem to be getting overlooked. After all, it was the Braves, not the Phillies, who made the playoffs last season, out of the blue as it was at Sun Trust Park. Now, we might get an encore for 2018 NL Rookie of the Year LF Ronald Acuna, Jr., who might soon be as good as Harper. 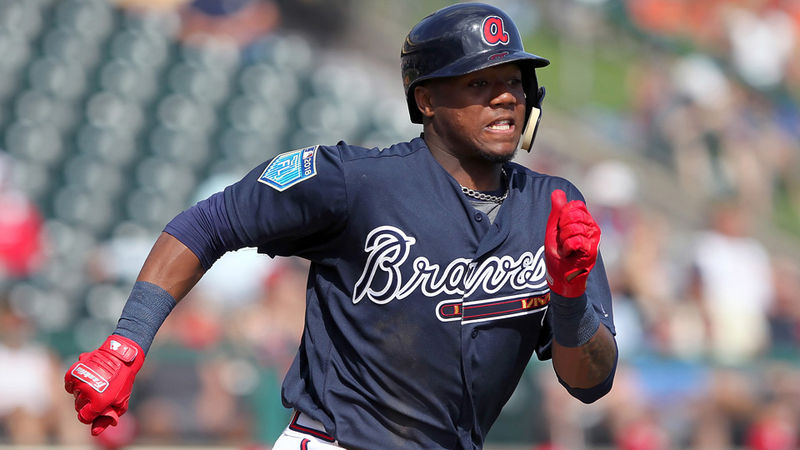 Atlanta has the enviable combination of youth and experienced talent with Acuna and 22-year old 2B Ozzie Albies, an All-Star a year ago (though he lost steam later in the summer). A worthwhile gamble might be the one-year deal given to former AL MVP 3B Josh Donaldson, who, if healthy, will definitely provide more cover in the lineup for Acuna and 1B Freddie Freeman. Meanwhile, liberating righty Kevin Gausman from Baltimore at the deadline last summer was a great bit of business as Gausman posted a 2.87 ERA in 59 2/3 IP. Along with Mike Foltynewicz, off of a career year (including a 2.85 ERA), plus hard-throwing Sean Newcomb and Julio Teheran, the staff looks better than the one in Philly, as well. A return to the playoffs for the Brav-os is certainly a possibility as we look “over” at Sun Trust. OTHERS: Someone has to lose in the East, and once again appearing glad to oblige are the Miami Marlins (63). The new ownership group that includes Derek Jeter did not exactly get off on the right foot with the fan base by immediately shipping out all of the marketable commodities (Giancarlo Stanton, Christian Yelich, Marcell Ozuna last year; C J.T. Realmuto, the closest to a star on 2018’s depleted roster, recently went to the Phils on Feb. 7, while capable closer Kyle Barraclough was sent to the Nats as new Miami management apparently doesn’t even mind helping to strengthen division rivals!) in a crass payroll dump for the open-ended rebuild. Which many in the region believe, with some justification, allows the new group to simply run the operation on the cheap and hope that MLB’s rising popularity also allows the value of the Miami franchise to increase and provide the consortium with a chance to return a nice profit in a few years. Good for the bottom line, perhaps, but not for the support base, which by this point is getting tired of being burned by the many Marlins fire-sales throughout their history. Thus, cut-rate offseason vet additions 2B Neil Walker and OF Curtis Granderson immediately loom as trade bait. If there’s a bit of hope, it’s perhaps in a rotation where young arms Jose Urena and Caleb Smith (before injury) impressed. Once they get good, however, and close to the point they’ll cost the Marlins some real money, they’re probably trade bait, too. We can’t do anything else other than look “under” in Miami. Apparently no longer content to sit back and let the Yankees steal all of the local headlines, the New York Mets (85½) got real aggressive in the offseason. New GM Brodie Van Wagenen shook things up, alright, trying to bolster the lineup by adding C Wilson Ramos, 3B Jed Lowrie, and 2B Robinson Cano, who returns to the Big Apple after a several-season exile in Seattle, plus adding another ex-Mariner in Edwin Diaz, slated as the new closer for 2nd-year manager Mickey Callaway. It is worth noting, however, that the Mets are being asked to improve nearly ten games from last year’s 77 wins in a division that aside from Miami is decidedly strong. It is a bit tantalizing, however, to envision Noah Syndergaard healthy once again and teaming with last year’s NL Cy Young winner Jacon deGrom at the top of the rotation. No matter, we’re still looking “under” at Citi Field. While the masses seem to be focusing most of their attention in the East upon the Phils and Mets, we have to wonder if the sans-Bryce Harper Washington Nationals (89) are being a bit overlooked. The core is still solid; even minus Harper, an outfield of last year’s comet Juan Soto, another young star in Victor Robles, and Adam Eaton might be as good as any in the NL. Meanwhile, the left side of the infield is stacked with 3B Anthony Rendon and SS Trae Turner, looking for a third straight year of 40 or more steals. Vet 2B Brian Dozier, over from the Dodgers, will hopefully provide the sort of production that Daniel Murphy did a few years ago. Plus, there’s the terrifying duo at the top of the rotation in Max Scherzer and Stephen Strasburg, while ex-Diamondbacks lefty Patrick Corbin was the top available starting pitcher in the FA crop. Now, if manager Dave Martinez can’t make this mix work by midseason, should Mike Scioscia be on GM Mike Rizzo’s speed-dial? “Over” at Nats Park, where we hope to visit this season and, as always, will enjoy one of those incomparable chili half-smokes from one of the Ben’s Chili Bowl locations at the ballpark. Are we leaving the best for last in the East? We’re not sure with the Philadelphia Phillies (89), who are generating an awful lot of buzz for a team that only won 80 games last season. Of course, the main reason for the new-found attention is the addition of RF Bryce Harper, who moves up I-95 from D.C. and the Nats with a new mega-contract; does Harper realize what he’s in for from the Philly fan base if he goes into a slump? But even before the recent signing of Harper, the Phils made some notable upgrades with SS Jean Segura and C J.T. Realmuto, while it is hoped that OF Andrew McCutchen, on the downside of his career, can still provide some spark and leadership. The various offseason moves have also allowed Rhys Hoskins to move to his natural 1B position from the outfield. And there’s a potential Cy Young winner (Aaron Nola) at the top of the rotation. But beyond perhaps Jake Arrieta, there are some questions with starters 3 thru 5. And let’s just say that manager Gabe Kapler puzzled some onlookers with various moves and strategies in his debut a year ago. The bar has been set pretty high in Philly, and we think this could go either way; it’s a pass for us at CBP. Though, when we have the chance, we’ll tune into WIP 94.1 FM on the web to find out what they’re saying in Philly (we can already guess, but we’ll listen nonetheless). NL CENTRAL: BEST BET... While it took a while for the baseball offseason to sort itself out, one of the key moves was done as they usually are around the winter meetings, when the St. Louis Cardinals (88)made a deal with the D-backs for 1B Paul Goldschmidt, a consistent power producer and annual MVP threat, not to mention an All-Star four years running. By us, we think this might be the best offseason addition of any team in the NL, including the Phils with Bryce Harper. And, like past players such as Jim Edmonds and Matt Holliday that were impressed by the organization and fan base in St. Louis, “Goldy” immediately inked a $130 mill extension. Adding Goldschmidt also allows Matt Carpenter to move back to his more-natural 3B. Meanwhile, young CF Harrison Bader could emerge as a breakout star. Like many teams, a healthy rotation is no guarantee, but if the Big Red gets some luck in that regard, the makings of a solid staff are in place with Carlos Martinez and last year’s sensation Miles Mikolas, all in front of fireballing closer Jordan Hicks. Lefty Andrew Miller, not long ago the best set-up man in the game, was also added in the offseason. Total it up, and we think this is the team to beat in the Central, so it’s an “over” for us at Busch Stadium. OTHERS: The Cincinnati Reds (78½) just can’t seem to catch a break. Key 2B Scooter Gennett, off a 23-homer, 92-RBI season and first All-Star trip, suffered a strained groin on a routine play last Friday in Cactus League action vs. the Brewers and will be lost for 2-3 months. Hardly the sort of news that new manager David Bell needs to hear, as hopes have risen in the Queen City despite winning only 67 a year ago. Cincy thought it made some upgrades in the offseason, dealing with the old enemy Dodgers, though in reality we’ll see if the diva acts of OFs Matt Kemp and Yasiel Puig disrupt the clubhouse, or if they really help protect Joey Votto in the batting order. No longer waiting for the farm system to deliver another not-ready-for-primetime option to the rotation, GM Nick Krall went into the marketplace for needed help, and a new-look rotation features ex-Nat Tanner Roark and ex-Dodger Alex Wood to go along with last summer’s addition Sonny Gray. We applaud those pitching moves in particular. Gennett’s injury, however, will test Cincy’s depth, and pitching has been so suspect in Cincy for so long that we need to see improvement before we believe it. For now it’s an “under” at Great American Ballpark, and we can only imagine how cranky vet play-play-play man Marty Brennaman might become on Reds radio, or how he’ll respond if Kemp and Puig begin to act up. They were the NL’s answer to the Oakland A’s last season, as no one was expecting the Milwaukee Brewers (86½) to make the sort of breakthrough they did, beating the Cubs in a playoff for the Central title and then advancing to the NLCS before a bitter 7-game exit courtesy the Dodgers. But no reason the good times shouldn’t roll again in Milwaukee, especially after addressing the concerns at catcher by adding ex-Dodger Yasmani Grandal in free agency. Grandal appears a major upgrade from last year’s duo of Manny Pina and Erik Kratz (since dealt to the Giants). Last year’s OF additions of Christian Yelich and Lorenzo Cain proved a boon to the Brew Crew, who also proved they’re in win-now mode by moving aggressively at the deadline last year (Mike Moustakas and Jonathon Schoop, though the latter didn’t help as much as expected). The key to a playoff return, however, remains a deep bullpen with dual closer options in Josh Hader and Corey Knebel. The staff lucked out that journeyman Jhoulys Chacin (15 wins!) emerged as an ace, but as long as Craig Counsell gets the same sort of work from his relievers, he can live with modest results from his starters. It’s an “over” for us at Miller Park, and we advise listening to the Brewers on Sirius radio while we can still enjoy the one and only Bob Uecker behind the microphone. The budding dynasty of the Chicago Cubs (88½) has not yet materialized beyond that 2016 World Series win. Though it has been nonetheless been a notable era for the Cubs, who have made the playoffs four straight years (a franchise record) since Joe Maddon took over in the dugout in 2015. But the Cubs have dealt away a lot of prospects in recent years, and that might come back to bite them at some point soon. The bloom did seem to come off last October when, on successive days at Wrigley Field, the Cubs lost the NL Central playoff to the Brewers and then the wild card game vs. the Rockies. This after the addition of Yu Darvish turned into a non-event with his elbow surgery following just 40 IP as a Cub. A healthy Darvish could still team with Jon Lester, Kyle Hendricks, and Cole Hamels for one of the NL’s best rotations. But the offense needs a healthy 3B Kris Bryant after he was diminished by a shoulder injury last season and being a far cry from his 2016 MVP form. Now, SS Javier Baez, off a 34-homer year, might be the center point of the offense. Expect Maddon to make good use of ex-Diamondback Daniel Descalso, who plays a variety of positions. We’re just not sure which direction this goes at Wrigley, so we’re going to pass instead. Anyone who ever wondered about Clint Hurdle’s capabilities as a manager should have paid attention to last year’s Pittsburgh Pirates (77½), who surprisingly stayed on the fringe of the NL playoff race until deep into September and finished at 82-79, which should have qualified Hurdle for some Manager of the Year votes. But with few reinforcements in the offseason, Hurdle is going to be hard-pressed to wave that sort of magic wand again. Already, RF Gregory Polanco is on the shelf with a shoulder injury (the same one suffered last September) that likely keeps him out for at least a month. There’s also a new look up the middle, where last year’s double-play combo of Josh Harrison and Jordy Mercer has been replaced by well-traveled 2B Adam Frazier and, apparently, young SS Erik Gonzalez. Not sure that‘s an upgrade. The staff should be a strength, especially if ex-Ray Chris Archer can rediscover his best Tampa Bay form after disappointing following his addition at the deadline. Jameson Taillon and Trevor Williams, however, look solid at the top of the rotation, while Hurdle and pitching guru Ray Searage have plenty of live arms in the bullpen. It’s that pitching which gives the Bucs a chance, but it’s got to be good, because this offense isn’t going to score many runs. Hurdle will be doing well once again to get Pittsburgh to .500, but at this price we’re thinking it’s best to just take a pass at PNC Park. NL WEST: BEST BET...So much for the long-held belief that the Colorado Rockies (84½) were never going to have enough pinching to win. Since Bud Black came in as manager, that’s all changed in Denver, as the Rocks have gone to the playoffs in back-to-back years mostly because their staff has been so solid. In fact, starters Kyle Freelund and German Marquez combined for 31 wins last season, with Freelund posting a 2.85 ERA. (A Colorado starter with a 2.85 ERA? Sheesh!) There still isn’t a left side of an infield in the NL with more pop than the Rocks have with 3B Nolan Arenado and SS Trevor Story, while it is hoped that adding vet Daniel Murphy (slated to start at 1B) will see his career jump-start at Coors Field. Which is known to do that for hitters. Colorado will have a shot at a third straight playoffs, which is three more than the Broncos have had the past three seasons, so we look “over” in Denver. Sources have told us that there is so much talent in the Los Angeles Dodgers (93) system that the Blue should be able to stay a contender for the next 5-6 years. Will the Dodgers eventually get to 10 or more NL West titles in a row (it’s six and counting now) before one of the division foes finally rises up and says enough is enough? For the purposes of this piece, however, we only concern outselves with exceeding, or falling short, of those projected 93 wins. We’re not sure, as LA fell just short of that a season ago, and that was before some semi-serious housecleaning in the offseason. Though we don’t think the Dodgers will miss Matt Kemp and Yasiel Puig, we’re also not sure new CF AJ Pollock, who has battled injuries the past couple of years, will be an upgrade. The staff is still solid, though all indicators are that Clayton Kershaw (who has also landed on the DL more often the past couple of years) is no longer nonpareil on the mound after losing more than a bit of his velocity last season. Elsewhere the rotation is filled with components who have had injury issues or, in the case of new ace Walker Buehler, is working on a restrictive season-long innings count. Getting past 93 wins might be as tough as it was a year ago, so we look “under” at Chavez Ravine. Here’s our suggestion to the San Diego Padres (78½); ditch those drab blue-and-white uniforms that lack originality, and go back to the old “taco” look. We don’t mean those poor facsimiles worn on Friday night home games the past couple of years, either. We mean full time to the dark brown, yellow and orange, and with the white shoes, to boot! After all, it’s time to forget the past 20 years or so and harken a new era at Petco Park with the FA signing of 3B Manny Machado, who shocked the world when inking with the Friars last month. But this might signal a change of fortunes for this moribund franchise that believes it has talent in the pipeline ready to deliver. One of those emerging young stars, 2B Fernando Tatis, Jr., could arrive soon, though in the meantime vet Ian Kinsler, a valued jack-of-all-trades, should prove a useful stop-gap for manager Andy Green. The outfield also features promising system products who now have MLB experience under their belts, with Manuel Margot in center and Hunter Renfroe in right. Pitching is an issue, though Joey Lucchesi proved a revelation last season, and young Eric Lauer has earned the opening day start. If these various pieces mesh, the Pads might give their long-suffering fans a playoff chase to cheer about for the first time in a decade. Padres? Playoffs? We’re looking “over” at Petco. This will be the final lap around the track for San Francisco Giants (73½) manager Bruce Bochy, who has announced he’ll hang ‘em up at the end of the season. We wonder, however, if Bochy might push the date forward if the Giants struggle again, as we suspect. San Francisco is 54 games under .500 the past two seasons, and if this campaign is going sideways, as some anticipate, will Bochy really want to stick around until September? San Francisco’s lineup is old and didn’t add much in the offseason; the offense looks a mess, especially with Buster Posey coming off hip surgery. Hard as it is to believe, 3B Evan Longoria is now on the downside of his career (where did the years go?). And there is no chance the Giants threaten the mid 70s in wins if Madison Bumgarner goes on the shelf, as he has for extended periods the past two years; there isn’t much depth in the staff, either, and doubt offseason addition Drew Pomeranz, looking to revive his career, proves a significant boost. The only mystery in SF is if Bochy will want to stick around for the inevitable testimonials in September, which could ring a bit hollow if SF is sitting far outside the playoff chase. It’s an “under” at what they now call Oracle Park, though as long as Jon Miller, Dave Fleming, Duane Kuiper, and Mike Krukow are doing the their post-game “Giants roundtable” on blowtorch KNBR 680, it’s must-hear stuff...even when the Giants lose. And then there were the Arizona Diamondbacks (75½), an opportunity missed the past couple of seasons when it looked like a contender was being assembled in Phoenix. The breakthrough playoff season of 2017 raised hopes almost as quickly as they became dashed a year ago, as Arizona fell to 82-80. Which preceded an offseason roster revamp that got rid of stalwarts such as Paul Goldschmidt, AJ Pollock, and Patrick Corbin. The departures of Goldy and Pollock have caused position switches, with 3B Jake Lamb now slotted into 1B and Ketel Marte moved from SS to Pollock’s old spot in CF. So there could be defensive questions as well as at the plate. Then there is the pitching, as skipper Torey Lovullo is crossing his fingers that Zack Greinke’s slight drop in velocity a year ago doesn’t presage a steeper descent in 2019, while Robbie Ray had significant control issues last season. At least the bullpen, with newly-added closer and former All-Star Greg Holland, plus colorful, bearded set-up man Archie Bradley, looks durable. The win total has been reduced, and it’s possible that Arizona can exceed the mid 70s in victories. But with a new-look roster, it’s hard to be bullish; we’ll simply pass instead at Chase Field.